Food for the soul: Prayer is the best shield against all trials. A heart to heart talk with God will lessen your burden for He will never say no to those who believe in Him� a Blessed day. Vote for the Philippines' entry to the New 7 Wonders of Nature: 1). Chocolate Hills of Bohol, 2). Mayon Volcano of Albay and 3). Tubbataha Reef Voting for nominees will continue through Dec. 31, 2008. A New7Wonders Panel of Experts will then select the 21 finalists, from which voters worldwide will elect the New 7 Wonders of Nature. Log on at www.new7wonders.com. It�s Sukaran, The Domestic Architecture of the Towns of Loay and Loboc in Bohol launching on April 15, 5 p.m. at the People�s Mansion. Cocktails to follow at 6 p.m. Patroness of arts and culture and Bohol�s adopted daughter Bea Zobel Jr spearheaded the program. On the following day, April 16 is the symposium on Architecture of Place: Putting Bohol in its Tourism Infrastructure and Facilities at the Grand Ballroom B of Metro Centre Hotel from 1 to 5 p.m. For further information, you may contact Sarah at (038) 501-9287, 4113946 or Joe at 09173044599, 5019817, 4113432 local 134. Could it be true that Kim Chiu�s crush here in Bohol is the young entrepreneur and animal advocate Baba Yap? Yes, according to True unimpeachable Very Reliable Source (VRS) Kim Chiu said this when she was asked by a local dj who�s a prominent figure she�s falling over head and heels here in Bohol. �No comment, it�s no longer new right?� VRS said. Could it be true that this young socialite�s (who�s into business) boyfriend has bounces a big check? According to VRS, his attention was called by the bank admin for writing a bad check last week. No big deal, right? We all mistakenly bounce a check sometime in our lives. Uh-uh. Not for P250,000, and the funds in his bank account weren't even close to that amount. But this boyfriend is saying it was a big a misunderstanding - and he went willingly with police officers - to work it out. Despite the �controversies� that mounted on the airlines, 37 mayors, vice mayors and their families are confirmed to go to Guam, USA on April 16 to attend the Conference of the Association of Pacific Islands Legislators (Apil). They have had their visas last Monday. Of course, the budget and the pocket money is shouldered by the municipal government approved by the DILG. "We will go because the DILG permitted us," Sevilla Mayor Digal told True on Monday (By the way, congratulations to Karen Digal, mayor�s daughter who graduated high school at Sevilla High School and SK national president Jane Censoria Cajes was the guest speaker). After the Guam conference, sources said that other officials will proceed to Thailand and china tours. Fora at www.dyrdam.com and www.dytrbohol.com and text messages bared negative reactions that the tour is "wasting public money." "It's okay they will attend the conference, but the people expect something in return. It's just an R&R using public money," one texter said on dyrd textklamo. It can be noted that the association of barangay captains (ABC) had their conference in Baguio last year and it became a controversy when the captains got their funding from the barangay with the registration fee was unreasonable. On the other hand, Trinidad Mayor Judith del Rosario Cajes who opted not to attend the conference. She said she would devote more of her time to her constituents. Mayor Cajes was very busy attending official functions and I had to accompany her when she attended the commencement exercises of Tagum Sur High School. Mayor Caje�s memorable lines she shared to the graduates: hardwork pays, laziness does not. "This is another source of corruption, instead of going there to relax, they should focus on something good for their constituents. There is a rice shortage now and tell me how these mayors could solve it. The people are dying," one radio caller said. Aligned with the city�s fiesta activities in honor of St. Joseph the Worker, the City Government of Tagbilaran gears up for yet another edition of the city�s most prestigious search, the Miss Tagbilaran 2008. The Search, headed by City Tourism Head Mariano L. Uy, is aimed at choosing the city�s ambassadress of goodwill, who possesses both beauty and wit and best exemplifies the values of a true Tagbilaranon. To qualify the competition, hopefuls must at least be 16 but not more than 21 years of age; single and never been pregnant; at least 5 feet and 2 inches in height; and of good moral standing in the community. Applicants may represent a barangay where she has resided for at least three months or an educational institution where she has enrolled for at least one semester preceding her application. The contestants are also required to submit a duly accomplished application form, one 2� x 2� colored picture, photocopy of birth certificate, and barangay clearance or endorsement from educational head. Aside from the possibility of grabbing the revered Miss Tagbilaran 2008 title, sumptuous prizes pegged at P20,000, P15,000 and P10,000 for the Miss Tagbilaran, 1st and 2nd Runners-up, respectively, are also at stake. Candidates may also take home scores of minor awards. Deadline of filing of application is on April 14, 2008. For more information, interested ladies may contact the City Tourism Office at 235-5497. Since, it�s summer; it�s a good opportunity to having a pet at home. The last time we had a pet was two years ago. I become emotional when I talk about my pets even it they�ve all gone underground. Most of us love to have dogs as pets. Dogs are loving pets. Having a pet dog of your own is a pleasurable experience. They said, dogs are man�s best friends. You will be rewarded with a wonderful companion and a priceless human-canine relationship. We had dogs at home when I was a kid. We had Jojie, a bearded collie. Then, there was Whity, a Tibetan terrier and I loved to cuddle her because of her curly and white hair. Browny came to our home when Whity died. Browny, a Belgian malinois, was remembered a good dog because everytime he would ask for a food, he would have his head on your lap. He met an accident to shorten his life. 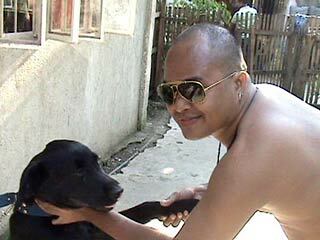 Then, Blacky became our pet when my sister Ruth adopted this native dog. He reached 16 years old. Now, our three-month old labrador Chubby retriever and the parakeets (of the parrot family and people have mistaken them as lovebirds but actually it�s not) are our latest additions to the family. As of this writing, Chubby is sick. She is admitted at Egos Clinic (along CPG avenue corner Gallares street or fronting the BGY Enterprises, contact number- 411-3725). It has been days she stopped eating and I decided to take her to Dr. Gerito �Gerry� Egos, Bohol�s popular and celebrated veterinarian. She�s diagnosed of having fever. In Bohol, the Yap family started the tradition of dog breeding. The first generation of the Yap were successful dog breeders and were passed on to brothers John and Cecile who formally created and formed a canine association here in Bohol. Baba Yap continued the tradition and is an excellent dog breeder. Remember Baba with his �lab�?�yeah, his labrador. Back to Chubby, Doc Egos together with Dr. Cherry de Asis treated Chubby. 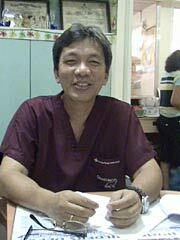 Doc Egos has a supportive staff composed of Aiza Rizon, Ronald Doloritos and Richard Hoffeli�a. They are there to give a helping hand and to assure you that your pets are in good hands at Egos�. Our conversations had led to how we take care of Chubby. Doc Egos said that we should listen for your puppy's cues that he needs to relieve himself in the middle of the night. It may take a while before he can sleep through the night without a potty break. Remember, it was your choice to get this puppy. �We should treat our pets as humans,� Dr. Egos said. At Egos Clinic, you can avail of cosmetic surgery like tail docking, ear cropping and proper grooming. It was also an experience to see first hand how animals undergo operation. Our awareness and consciousness about pets grow into higher level. Unlike before, only a handful few have pets, now, many Boholanos love to have pets at home. And now the question: how to choose a pet? There are a lot of things to consider before choosing a family pet. The internet provides you the needed information before you make that visit to the pet store or animal shelter. According to Doc Egos, �it�s your love for animals.� A pet will affect your entire lifestyle, added said Dr. Cherry. It made us laugh, it made us feel good. Do I have the time to take care of a pet? Acquiring a pet can be a big commitment. Some pets, like goldfish, are certainly less demanding than puppies, but still need care and attention. If you must have that cute little puppy, remember that your biggest investment will be time. Puppies can�t be left alone and need to be trained and monitored. Older dogs can take time as well. They need to adapt to their surroundings and, depending on the breed, will need daily exercise. Do I Have Room for a Pet? Cats can adapt to any size living quarters. The same can be said for birds, fish and small mammals that live in a contained environment. Smaller dogs may also be able to get the necessary exercise inside, but larger, active dogs need more space and more daily exercise. Make sure you have a safe place for your pet during the day. Unless you live on a farm, don�t let your cats and dogs run free. Keep them on a leash or in an enclosed area. If you rent, you need to be aware of any no pet clause. This usually applies to cats and dogs which means the fish and the parakeet can stay. Some no-pet clauses will allow for pets if you leave a security deposit or a small monthly surcharge, used for cleaning if necessary when you vacate. What kind of pet do I want? Think about your lifestyle and the type of things you enjoy. Research the types of pets available at your local library or on the internet. Talk to your veterinarian and other people who own the type of animal you are considering. Learn about the temperament and the behavior patterns, how much activity the pet needs and the animal�s dietary and housing needs. Dogs need daily care and attention, while cats are more independent. Dogs will love you no matter what. Cats will too, but they only tell you about it when they want to. But cats are much more self sufficient and will survive quite well with fresh food and water and a frequent change of the litter box. If you�re considering the pet for a child, the ideal choice is probably a dog. A dog, especially a puppy, will delight in the child. A cat may or may not even notice the child is around. Can I afford to acquire a pet? Unfortunately, we too often see notices for �Kittens. Free to a good home.� from an owner who didn�t spay or neuter their animal. We�ll get to that in a minute, but first you need to consider there is no such thing as a �free� animal. While you may indeed acquire an animal from someone with an unexpected litter of kittens or puppies, you need to consider the costs of food, veterinary care, grooming, toys, pet license and more. The cost for a pet varies with the type of animal and your location. All pets require the basic food and shelter. They should also have regular visits to a veterinarian for health checkups and vaccinations. Other costs could include boarding and obedience training. In some cases, pet health insurance is now available and may be something you wish to consider. What type of extra housing or equipment will I need for a pet? Will you need to purchase a doghouse? Fence in your backyard? Buy a pet bed? By an indoor kennel? Animals, especially dogs, need toys. Providing your puppy with appropriate chew toys may save your favorite shoes. Will my children adapt well to a new pet? Children naturally love animals. But, you need to consider the maturity level of your children. Toddlers can pull on a dog�s tail, or carry Fluffy around by the neck. Adult animals tend to be a little more tolerant of children. And certainly you want to investigate the breeds that mix well with children. But, children, while acting in total love and devotion to an animal can unintentionally be cruel. Instinctively a dog might snap at a little hand or a cat might wield some sharp claws across a cheek. Whatever you do, never leave babies and small children alone with animals. Even the most docile pet can turn when they feel threatened. Never forget that this is an animal. Will my other pets tolerate a new pet? It�s no secret that cats and dogs don�t get along. If the cat has been with you for a number of years, think long and hard about bringing in a new dog. Introduce them slowly and be patient. Older animals of the same breed might also be jealous of a new animal on the scene. Does anyone in my family household have allergies? As much as possible, ask that question before bringing home the animal. Finding out that your wife gets hives and can�t breathe when a cat is in the room is not something you wish to discover by accident. Ask her first. Talk to your children�s doctor and observe how they do around other animals. These are just a few things to think about when you consider adding a pet to your family. Think these things through. Once you have, you�ll be able to make a much more informed decision about pet ownership. My wife and I have recently retired to Panglao Island. We have always loved dogs and when a friend offered us 2 puppies (brother & sister) we accepted. However we need to visit the UK in May for up to 3 weeks. We are looking for boarding kennels to look after Jack & Holly. They are currently 4 months old and house trained. 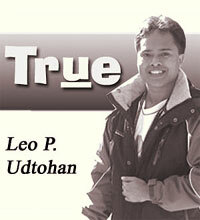 your comments on "True: Let�s talk about pets"
This article has been viewed 46 times.